Posted by rogerhollander in Honduras, Latin America. Featured Vigil Speakers from Honduras and Costa Rica Denied Visas to the U.S. Call Jennifer Bantrump of the Costa Rica Desk of the State Department at (202) 647-3519. Sample script below. Call Gabriela Zambrano of the Honduras Desk of the State Department at 202-647-3482. Sample script below. Write Consul General Paul Birdsall at the U.S. Embassy in San Jose, at consultarsanjose@state.gov and copy Jennifer Bantrump of the Costa Rica Desk of the State Department at bantrumpjr@state.gov Sample script below. Write Consul General William Douglas of the U.S. embassy in Tegucigalpa, Honduras at usahonduras@state.gov and copy Gabriela Zambrano of the Honduras Desk of the State Department at zambranomg@state.gov Sample script below. I understand that Mr. Brenes presented an invitation from the School of the Americas during his interview, as well as sufficient evidence that he had strong ties that would bring him back to his country. I understand that Mr. Ramirez presented an invitation from the School of the Americas during his interview, as well as sufficient evidence that he had strong ties that would bring him back to his country. According to the agreement, increased cooperation between the United States and Colombia is crucial “in order to address common threats to peace, stability, freedom, and democracy.” The Obama administration has repeatedly rejected the concerns of South American leaders by claiming that the ten-year cooperation agreement between the two countries only permits U.S. military operations to be conducted in Colombia in order to achieve these objectives and that it poses no threat to neighboring nations. “This is about the bilateral co-operation between the United States and Colombia regarding security matters within Colombia,” explained U.S. Secretary of State Hillary Clinton. Meanwhile, Colombia’s Foreign Minister Jaime Bermudez declared, “Some third countries have expressed some concern regarding the agreement. We have always said that this agreement applies exclusively to Colombia.” But nowhere in the agreement does it actually state that U.S. military operations launched from the Colombian bases are to be restricted to Colombia. This subtle omission in the text of the agreement is crucial when taken in conjunction with another U.S. military document. In its Fiscal Year 2010 Military Construction Program budget estimate, submitted to Congress in May 2009, the U.S. Air Force requested $46 million in funding to upgrade Colombia’s Palenquero Air Base, the largest base covered under the cooperation agreement. This document makes clear that U.S. military objectives related to the use of the Colombian bases extend far beyond Colombia’s borders to those South American countries viewed as posing threats to U.S. interests. According to the U.S. Air Force, the Palenquero base “provides a unique opportunity for full spectrum operations in a critical sub region of our hemisphere where security and stability is under constant threat from narcotics funded insurgencies, anti-US governments, endemic poverty and recurring natural disasters.” The term “full spectrum operations,” as the document makes clear, means that the Colombian base can be used as a launching pad not only for counter-narcotics and counter-terrorism operations, but for any form of military operation anywhere in South America. In conclusion, the U.S.-Colombia base agreement does not restrict U.S. military activities to the territory of Colombia nor does it limit them to counter-narcotics and counter-terrorism operations. In other words, the U.S. military can use the Colombian bases to launch any type of military operation it wants against any target anywhere in South America. And in its report to Congress, the U.S. Air Force made evident the importance of Colombia’s largest air base to achieving U.S. military objectives throughout South America, including managing the threat posed by “anti-US governments.” Clearly, South American nations, particularly Venezuela and Bolivia, have ample reason to be concerned. Two who know well the history of dictated U.S. terms are Dr. Juan Almendares, a medical doctor and award-winning human rights activist in Honduras, and the American clergyman Father Roy Bourgeois, a priest who for years has fought to close the U.S. Army’s School of the Americas (SOA) at Fort Benning, Ga. Both men link the coup in Honduras to the SOA. 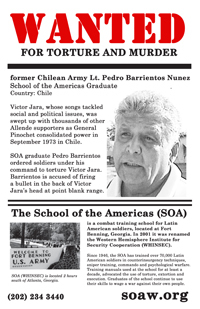 The SOA, renamed in 2000 the Western Hemisphere Institute for Security Cooperation (WHINSEC), is the U.S. military facility that trains Latin American soldiers. The SOA has trained more than 60,000 soldiers, many of whom have returned home and committed human rights abuses, torture, extrajudicial execution and massacres. Born in Louisiana, Bourgeois became a Catholic priest in 1972. 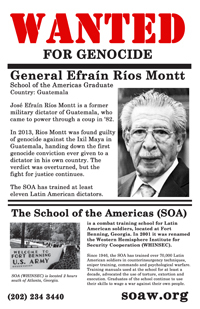 He worked in Bolivia and was forced out by the (SOA-trained) dictator Gen. Hugo Banzer. The assassination of Archbishop Oscar Romero and the murders of four Catholic churchwomen in El Salvador in 1980 led him to protest where some of the killers were trained: Fort Benning’s SOA. After six Jesuit priests, their housekeeper and her daughter were murdered in El Salvador in 1989, Bourgeois founded SOA Watch and has built an international movement to close the SOA. Honduran coup leader Vasquez attended the SOA in 1976 and 1984. Air Force Gen. Luis Javier Prince Suazo, who also participated in the coup, was trained at the SOA in 1996. Bourgeois’ SOA Watch office is just yards from the Fort Benning gates. He has been frustrated in recent years by increased secrecy at SOA/WHINSEC. He told me: “They are trying to present the school as one of democracy and transparency, but we are not able to get the names of those trained here-for over five years. However, there was a little sign of hope when the U.S. House approved an amendment to the defense authorization bill last week that would force the school to release names and ranks of people who train here.” The amendment still has to make it through the House-Senate conference committee. Bourgeois speaks with the same urgency that he has for decades. His voice is well known at Fort Benning, where he was first arrested more than 25 years ago when he climbed a tree at night near the barracks of Salvadoran soldiers who were training there at the time. Almost 30 years later, in a country bordering Romero’s El Salvador, the U.S. has a chance to change course and support the democratic institutions of Honduras. Undo the coup. Posted by rogerhollander in Latin America. Fund the campaign to close the SOA! Donate Now. All Out to Fort Benning, Georgia from November 20-22, 2009: Close the SOA! 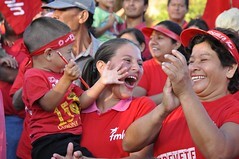 Today the eyes of Latin America – and much of the world – are focused on tiny El Salvador, as representatives from over 100 countries converge for the historic presidential inauguration of FMLN´s Mauricio Funes. Funes´ inauguration marks the end of the two-decade rule of ARENA – an ultra right-wing party that was founded by SOA graduate and death squad leader Roberto DÁbuisson. The new president inherits a nation devastated by poverty and violence, but also filled with hope. The deep commitment of Funes to Monseñor Oscar Romero´s “preferencial option for the poor”, along with FMLN´s long-term dedication to ideals of economic and social justice, bring a spirit of promise to all of Central America. A small SOA Watch delegation recently traveled to El Salvador to dialogue with this new government about the participation of Salvadoran soldiers in the SOA/ WHINSEC. Several officials of the new government, including Vice President Salvador Sánchez Cerén, met with the delegation and expressed an open spirit. Organizations within El Salvador echoed the plea that the new government withdraw troops from the SOA/ WHINSEC. At the May Day march, the Comadres (mothers of the disappeared) spoke of this imperative before the crowd of historic proportions. 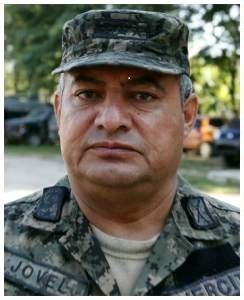 The Dean of the University of Central America (UCA) publicly stated that the continued training of troops at a school noted for teaching torture would be “intolerable”. The SOA Watch delegation also visited Honduras, where they met with President Manuel Zelaya, as well as the Honduran Defense Minister and Chancellor. The SOA Watch delegation was privileged to be invited to participate in an all-day meeting with the president, his cabinet, and leaders of the country´s major social movements, to discuss new directions for the country. One of the nine formal proposals brought to this important gathering included the recommendation that Honduras withdraw its troops from the SOA/ WHINSEC. Members of the SOA Watch movement in the U.S. are lobbying their members of Congress to sign on to H.R.2567, the bill that would suspend operations at the School of the Americas (SOA/ WHINSEC) and set up a task force to investigate the connection between human rights abuses in Latin America and U.S. foreign military training. It is heartening to know that our southern counterparts are also organizing to close the school – by attrition. We are coming together – those whose tax dollars fund the school and those whose countries have been devastated by it, to close those doors of destruction, to open new doors of respect. Click here to read Lisa’s article about the Central America delegation. Support SOA Watch’s efforts in Latin America with a donation today. Click here to contribute now. The Pentagon budget submitted to Congress on May 7 includes $46 million for development of a new U.S. military base in Palanquero, Colombia. The military facility in Colombia will give the United States military increased capacity for intervention throughout most of Latin America. The plan is being advanced amid tense relations between Washington and Venezuela, Bolivia, and Ecuador, and despite both a long history and recent revelations about the Colombian military’s atrocious human rights record. November 20-22, 2009: Converge on Fort Benning, Georgia – SHUT DOWN THE SOA! From November 20-22, 2009, thousands of progressive activists will converge at the gates of Fort Benning in Columbus, Georgia for the annual vigil. In this exciting political climate, there is an air of cautious optimism that the School of the Americas (SOA/WHINSEC) will be closed during this Congress. However, we recognize that the School of the Americas has operated under both Republican and Democratic presidents and there is still a lot of work to be done! It will take more than change in the White House to change the foreign policy of violence and imperialism that the SOA/WHINSEC represents, but Washington is feeling the pressure. Now is the time to educate the public and to show lawmakers that we have had enough. It is never too early to begin coordinating travel plans and organizing groups to travel to Columbus. Together we can show that the people of the Americas are taking a stand against violence and torture. Let’s mobilize our communities to make our voices heard! We need to raise $70,000 to make the November Vigil to close the School of the Americas a success. Click here to make a donation to SOA Watch today. We appreciate your interest! You are subscribed to this list as rogerholla@easynet.net.ec. Click here to fund the campaign to close the SOA. Posted by rogerhollander in Foreign Policy, Latin America. Legislation to Suspend Operations at the School of the Americas and to Investigate its Connection to Human Rights Abuses in Latin America Introduced in Congress. Contact your Representative Now!New SOA/ WHINSEC Legislation Introduced in Congress! If you haven’t already signed the petition to President Obama asking that he close the SOA/ WHINSEC by executive order, click here to sign the petition online! Saturday 23 May 2009, by Prensa – Colectivo: A preventive measure of detention was issued against the former commander of the Palacé Battalion, Lieutenant Colonel Jorge Alberto Amor Páez, by the specialized human rights prosecutor in the city of Calí, Juan Carlos Oliveros Corrales. 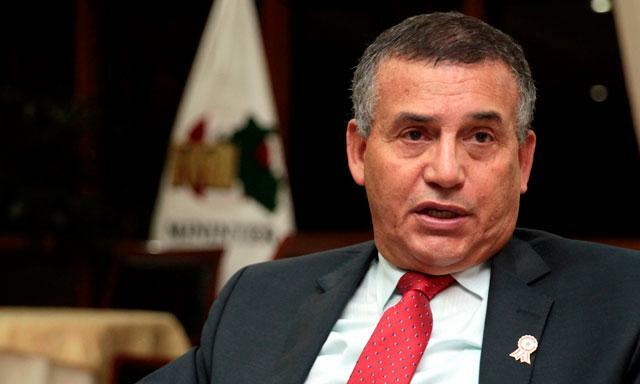 This warrant confirmed Amor Páez’s participation in the massacre of 24 peasant farmers, which took place in the rural communities of Alaska, Tres Esquinas and La Habana, in the municipality of Buga in the department of Valle del Cauca, on October 10, 2001. For its 12th consecutive year, the Torture Abolition Survivor Support Coalition (TASSC) will hold a 24-Hour Vigil in Washington, DC, on Saturday, June 27, across from the White House. The Vigil will be attended by survivors of torture from around the world and supported by many friends and colleagues. In sadness, we share that Fr. 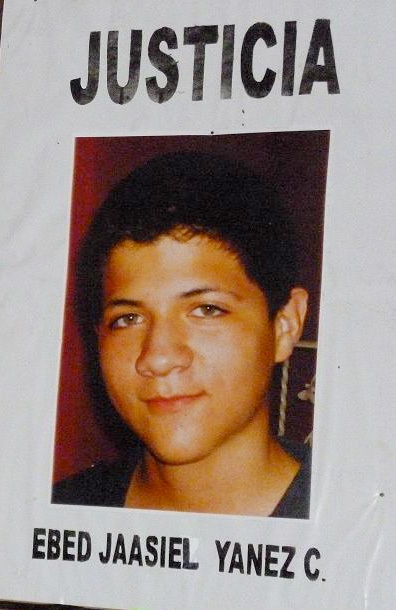 Larry Rosebaugh OMI was shot to death in Playa Grande, Guatemala on May 18th. He was a member of the Missionary Oblates of Mary Immaculate. He was killed by gunmen in an alleged carjacking while he and 4 other Oblates were on their way to a meeting. The gunmen escaped and did not take the van. One other Oblate, Fr. Jean Claude Nowama OMI was wounded, although not mortally. Larry Rosebaugh, along with Fr. Roy Bourgeois MM and Linda Ventimiglia carried out the first action at Fort Benning in 1983. After scaling a tree, they played one of Romero’s final sermons overlooking the barracks where the Salvadoran soldiers were training. Larry served 15 months in prison for the action. Many of us see this as the beginning of movement in the US. Since the 1960’s when Larry began protesting the Vietnam war he found him self in front of many judges and in numerous prisons for his protests against the School of the Americas, nuclear arms and war. In 1975, he was assigned to the missions in Brazil, where he spent 6 years. Returning to the US in 1981, he was a member of the Catholic Worker House community in New York City for 4 years, spent some time in El Salvador as a volunteer with Christian Volunteer Ministries, and, in 1993, was assigned to the Oblate mission in Guatemala, where he was serving when he was killed During his many years of ministry, Fr. Larry, often known as Fr. Lorenzo, was an advocate for peace and justice wherever he served. His autobiography, To Wisdom through Failure, was published in 2006. He spoke and read his new book at the 2006 November Vigil. Posted by rogerhollander in Barack Obama, Colombia, Cuba, Latin America, Mexico, Venezuela. At first glance Obama seems to have softened U.S. policy toward Latin America, especially when compared to his predecessor. There has been no shortage of editorials praising Obama’s conciliatory approach while comparing it to FDR’s “Good Neighbor” Latin American policy. It’s important to remember, however, that FDR’s vision of being neighborly meant that the U.S. would merely stop direct military interventions in Latin America, while reserving the right to create and prop up dictators, arm and train unpopular regional militaries, promote economic dominance through free trade and bank loans and conspire with right-wing groups. And although Obama’s policy towards Latin America has a similar subversive feeling to it, many of FDR’s methods of dominance are closed to him. Decades of U.S. “good neighbor” policy in Latin America resulted in a continuous string of U.S. backed military coups, broken-debtor economies, and consequently, a hemisphere-wide revolt. Many of the heads of states that Obama mingled with at the Summit of the Americas came to power because of social movements born out of opposition to U.S. foreign policy. The utter hatred of U.S. dominance in the region is so intense that any attempt by Obama to reassert U.S. authority would result in a backlash, and Obama knows it. Bush had to learn this the hard way, when his pathetic attempt to tame the region led to a humiliation at the 2005 Summit, where for the first time Latin American countries defeated yet another U.S. attempt to use the Organization of American States (O.A.S. ), as a tool for U.S. foreign policy. But while Obama humbly discussed hemispheric issues on an “equal footing” with his Latin American counterparts at the recent Summit of Americas, he has subtly signaled that U.S. foreign policy will be business as usual. The least subtle sign that Obama is toeing the line of previous U.S. governments — both Republican and Democrat — is his stance on Cuba. Obama has postured as being a progressive when it comes to Cuba by relaxing some travel and financial restrictions, while leaving the much more important issue, the economic embargo, firmly in place. When it comes to the embargo, the U.S. is completely unpopular and isolated in the hemisphere. The U.S. two-party system, however, just can’t let the matter go. The purpose of the embargo is not to pressure Cuba into being more democratic: this lie can be easily refuted by the numerous dictators the U.S. has supported in the hemisphere, not to mention dictators the U.S. is currently propping up all over the Middle East and elsewhere. The real purpose behind the embargo is what Cuba represents. To the entire hemisphere, Cuba remains a solid source of pride. Defeating the U.S. Bay of Pigs invasion while remaining fiercely independent in a region dominated by U.S. corporations and past government interventions has made Cuba an inspiration to millions of Latin Americans. This profound break from U.S. dominance — in its “own backyard” no less — is not so easily forgiven. There is also a deeper reason for not removing the embargo. The foundation of the Cuban economy is arranged in such a way that it threatens the most basic philosophic principle shared by the two-party system: the market economy (capitalism). And although the “fight against communism” may seem like a dusty relic from the cold war era, the current crisis of world capitalism is again posing the question: is there another way to organize society? Even with Cuba’s immense lack of resources and technology (further aggravated by the U.S. embargo), the achievements made in healthcare, education, and other fields are enough to convince many in the region that there are aspects of the Cuban economy — most notably the concept of producing to meet the needs of all Cubans and NOT for private profit — worth repeating. Hugo Chavez has been the Latin American leader most inspired by the Cuban economy. Chavez has made important steps toward breaking from the capitalist economic model and has insisted that socialism is “the way forward” — and much of the hemisphere agrees. It’s important to point out that, while Obama was “listening and learning” at the Summit of Americas, the man he appointed to coordinate the summit, Jeffrey Davidow, was busily spewing anti-Venezuelan venom in the media. This disinformation is necessary because of the “threat” that Chavez represents. The threat here is against U.S. corporations in Venezuela, who feel, correctly, that they are in danger of being taken over by the Venezuelan government, to be used for social needs in the country instead of private profit. Obama, like his predecessor, believes that such an act would be against “U.S. strategic interests,” thus linking the private profit of mega-corporations acting in a foreign country to the general interests of the United States. In fact, this belief that the U.S. government must protect and promote U.S. corporations acting abroad is the cornerstone of U.S. foreign policy, not only in Latin America, but the world. Prior to the revolutionary upsurges that shook off U.S. puppet governments in the region, Latin America was used exclusively by U.S. corporations to extract raw materials at rock bottom prices, using cheap labor to reap super profits, while the entire region was dominated by U.S. banks. Things have since changed dramatically. Latin American countries have taken over industries that were privatized by U.S. corporations, while both Chinese and European companies have been given the green light to invest to an extent that U.S. corporations are being pushed aside. To Obama and the rest of the two-party system, this is unacceptable. The need to reassert U.S. corporate control in the hemisphere is high on the list of Obama’s priorities, but he’s going about it in a strategic way, following the path paved by Bush. After realizing that the U.S. was unable to control the region by more forceful methods (especially because of two losing wars in the Middle East), Bush wisely chose to fall back a distance and fortify his position. The lone footholds available to Bush in Latin America were, unsurprisingly, the only two far-right governments in the region: Colombia and Mexico. Bush sought to strengthen U.S. influence in both governments by implementing Plan Colombia first, and the Meridia Initiative second (also known as Plan Mexico). Both programs allow for huge sums of U.S. taxpayer dollars to be funneled to these unpopular governments for the purpose of bolstering their military and police, organizations that in both countries have atrocious human rights records. The full implication of these relationships was revealed when, on March 1st 2008, the Colombian military bombed a FARC base in Ecuador without warning (the U.S. and Colombia view the FARC as a terrorist organization). The Latin American countries organized in the “Rio Group” denounced the raid, and the region became instantly destabilized (both Bush and Obama supported the bombing). The conclusion that many in the region have drawn — most notably Chavez — is that the U.S. is using Colombia and Mexico as a counterbalance to the loss of influence in the region. By building powerful armies in both countries, the potential to intervene in the affairs of other countries in the region is greatly enhanced. What these actions make clear is that Obama is continuing the age old game of U.S. imperialism in Latin America, though less directly than previous administrations. Obama’s attempt at “good neighbor” politics in the region will inevitably be restricted by the nagging demands of “U.S. strategic interests,” i.e., the demands of U.S. corporations to dominate the markets, cheap labor, and raw materials of Latin America. And while it is one thing to smile for the camera and shake the hands of Latin American leaders at the Summit of the Americas, U.S. corporations will demand that Obama be pro-active in helping them reassert themselves in the region, requiring all the intrigue and maneuvering of the past. Today, on January 26, six human rights advocates appeared in a federal courthouse in Georgia. The “SOA 6,” ranging in age from 21 to 68, were found “guilty” of carrying the protest against the School of the Americas (SOA/WHINSEC) onto the Fort Benning military base. The six were among the thousands who gathered on November 22 and 23, 2008 outside the gates of Fort Benning, Georgia to demand a change in U.S. policy towards Latin America and the closure of the SOA/WHINSEC. The “SOA 6” spoke out clearly and powerful in court today. They made a compelling case for the closure of the school and creation of a culture of justice and peace, where there is no place for the SOA mindset that promotes military “solutions” to social and economic problems. The six spent the weekend preparing for their trials with a team of lawyers, legal workers and volunteers, and today they stood up for all of us working for a more just world. Father Luis Barrios is the Chairperson of the Department of Latin American & Latina/o Studies at John Jay College of Criminal Justice-City University of New York and a Board Certified Forensic Examiner with the American College of Forensic Examiners. He is also an Associate Priest at St. Mary’s Episcopal Church, Manhattan, New York City. Fr. Barrios, as well is a Board Member of Interreligious Foundation for Community Organizing-Pastor for Peace. Professor Barrios is a columnist with El Diario La Prensa and has been honored with the Media Award-2006-GLAAD as an Outstanding Spanish Language Newspaper Columnist and was nominated again in the year 2008. He teaches courses on gangs, criminal justice, cultural criminology, forensic psychology, US foreign policy in Latin America, Puerto Rican Studies, race and ethnicity, and Latina/os Studies. Theresa M. Cusimano, J.D., served as a public interest advocate for twenty years. Her Italian/Irish passion for social justice has led her to work with: the U.S. Catholic Conference of Bishops on immigration and refugee issues, the federal Department of Education on the Americans with Disabilities Act and more recently with Colorado Campus Compact to support college campus engagement in community problem solving. Cusimano was born in New York, raised outside of Philadelphia and has the joy of living in the Rocky Mountain state of Colorado. She is both honored and extremely humbled to have participated in nonviolent civil disobedience with her five co-defendants who together, face trial on Monday, January 26th. On November 23rd, 2008, Kristin Holm, a first year student at the Lutheran School of Theology at Chicago (LSTC), along with five others, entered the base of the Western Hemisphere Institute for Security Cooperation’s (WHINSEC). Kristin is the third seminary student from Chicago to stand trial for civil disobedience at the WHINSEC vigil in the past five years. The others are Elizabeth Deligio, CTU, 2005; and Le Anne Clausen, CTS, 2008. Born and raised in Cleveland Ohio, second oldest of six children, Diane Pinchot entered the Ursuline Sisters of Cleveland after graduating from Villa Angela High School in 1963. She graduated from Ursuline College with a BA in Art Education in 1968 and has been teaching since. Her assignments have included Saint Ann’s School in Cleveland Heights, Lake Catholic High School in Mentor, Beaumont School in Cleveland Heights and, for the last 26 years, Ursuline College in Pepper Pike. After completing several degrees — an MALS at Wesleyan University in Conn. concentrating in metals and a terminal degree an MFA in Ceramic Sculpture in 1990 at Ohio University — the Diocesan Cleveland Mission Team in El Salvador in 1992 asked her to come and help design and build an altar on the spot where the Churchwomen were found in a shallow grave after they were raped and killed. This significant action slowly changed Diane’s life and over time the Central American martyrs, especially Dorothy Kazel, a member of the Ursuline community, inspired her to become more active in social justice groups within the community and other national organizations. Her artwork has also reflected this transformation, becoming more narrative and engaging the viewer to question the meaning behind the form. She has exhibited her work internationally, nationally and regionally and has come to realize the sacred connection of justice and art making especially when it is grounded in Peace and Love. Click here to read Sister Diane Therese Pinchot’s trial statement. I’ m a 64 year old pre-school teacher who retired last year. I was a teacher and director in pre-school programs in Richmond, VA. I have been married for 32 years to Marcia Deckinson. We enjoy birding, camping, scrabble, reading, silliness and each other. I’m a Vietnam Veteran from 1968 and it was then that’d realized there had to be a better way. The past forthy years I’ve been involved in peace, social and economic justice, gay rights, woman’s rights and death penalty issues. As I had said often to my four year olds in pre-school “Don’t hurt- use words”. I have been saying that, in various ways, to my government for many years. Born October 31, 1940 in Dresher, Pennsylvania (then some 30 miles outside of Philadelphia), and grew up on a farm there. Attended Goddard College in Vermont (1958-63), graduated BA in 1963. Spent one year (1961) in Denmark in work-study program. Job Training Officer (1964) with Flanner House, Indianapolis. Alternative service as a conscientious objector to military service in Laos (1964-67) building wells, water-seal latrines, and a school. Did postgraduate studies (1967-72) at the University of the Philippines, College of Agriculture. Freelance correspondent in the Philippines. (1969-72) with Dispatch News Service International and American Report. Freelance writer and researcher in London (1972-77) with Transnational Research Associates International. Co-founder and research director (1978-2005) of CovertAction Information Bulletin renamed CovertAction Quarterly, Washington, DC. Staff member (2007-present), Rock Creek Free Press, Bethesda, MD. Co-editor of two books, “Dirty Work: The CIA in Western Europe” (1978) and “Dirty Work II: The CIA in Africa” (1980). Have traveled throughout the Third World. Join grassroots activists and organizers for a series of events calling for a new Latin America policy and opposing militarization. SOA Watch is working with other Latin America Solidarity and social justice groups on a series of events from February 15-17, 2009 to push the U.S. Congress and the White House to close the School of the Americas and to bring real change to U.S. Latin America policy. Click here to unsubscribe, or reply to this email with “unsubscribe” in the subject line.